LAU | SAS | Education Department | News: LAU Students to Semi-Finals for Hult Foundation "President's Challenge"
The Hult Prize Foundation in partnership with President Bill Clinton and Banque du Liban, has launched a ground-breaking national level entrepreneurship and innovation program in Lebanon, empowering students in Lebanon to have the unique opportunity to compete for a local prize and the USD $1 Million Global Prize at the 2017 Clinton Global Initiative Annual Meeting in New York. The 2017 Hult Prize “President’s Challenge” is “Refugees - Reawakening Human Potential” and will focus on restoring the rights and dignity of people and societies who may be, or are forced into motion due to social injustices, politics, economic pressures, climate change and war. We will also work to restore the rights and dignity of those currently living in informal / illegal settlements. 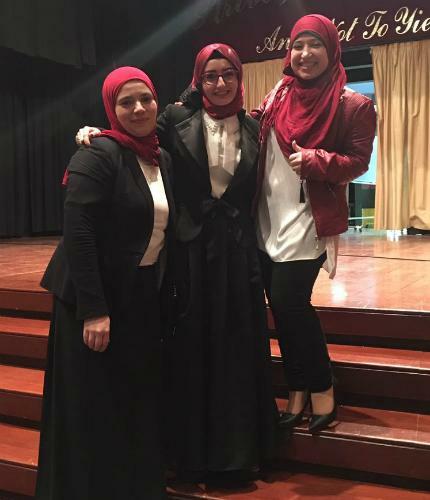 Asmaa El Ladan, Ola Samhoury and Ahlam Al Omary’s, current M.A. in Education students, presentation “Medicine Mile Away” was about empowering refugees by allowing them to take control over their lives and health. 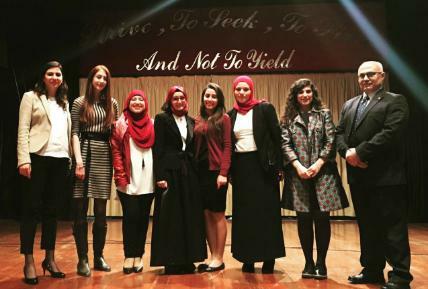 Among other teams from LAU, their team won the first place and will represent LAU at the semi-finals regional event in Dubai! Congratulations Asmaa, Ola, and Ahlam and GOOD LUCK!